Costs of Invasive Species. Some figures to put the cost in perspective (by Roy Bouchard, DEP). Discussions of Invasives Aquatic Plants include many words we all recognize, but the context is unfamiliar and confusing when applied to plants. In addition to the common usage, biologists use these terms to describe the ecological status of plant or animal populations and how they fit into a particular geographical region. Some terms are used interchangeably, such as nuisance and invasive, both with a negative connotation. Four categories (Binggeli, 1994) serve to cover the concepts used to describe the status and the distribution of a particular species. Nuisance, Noxious, Weed: any plant, either native or introduced, with a harmful or destructive influence on existing natural communities, interfering with the objectives or requirements of people. 12 MRSA 13001 -- (6) "aquatic plant" and (14) "invasive aquatic plant"
Invasive Aquatic Plants -- Known Locations in Maine (PDF) This map shows infestation areas by grouping contiguous lakes, rivers and streams into “lake systems.” Each system lists specific infested waters to provide as much precision as possible. "Be Aware of Aquatic Invaders". A pamphlet addressing both milfoil and illegal fish stockings, courtesy of the Sportsmans' Alliance of Maine and the Maine Department of Inland Fisheries and Wildlife. 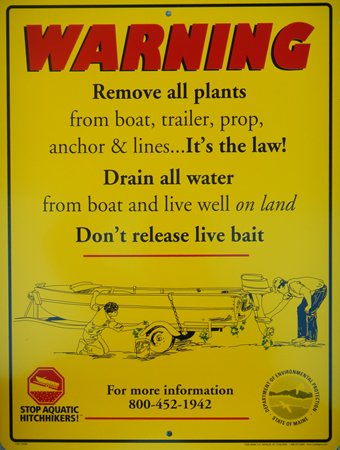 Boat Ramp Warning Signs are deployed throughout the state to inform boaters and others of the infestation status of a given lake and to remind them of the importance of inspecting boats and boating gear before entering and exiting all surface waters. They are available for uninfested and for infested water bodies. 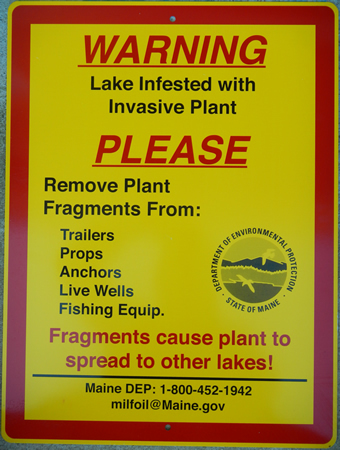 Invasive Plant Fact Sheets (off-site) are available for free downloading or by hardcopy for a charge from the Maine Cooperative Extension Publication Store. Also available are the following materials produced by the Natural Areas Program, Maine Department of Agriculture, Conservation and Forestry.